There are no comments for The Great Seal Of The State Of Minnesota. Click here to post the first comment. 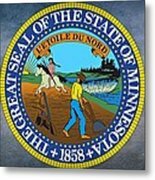 The Great Seal of the State of Minnesota is the state seal of the U.S. state of Minnesota. The sun, visible on the western horizon, signifies summer in the northern hemisphere. The horizon's visibility signifies the flat plains covering much of Minnesota. 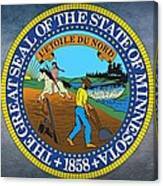 The Indian on horseback is riding due south and represents the great Indian heritage of Minnesota. The Indian's horse and spear and the Pioneer's ax, rifle, and plow represent tools that were used for hunting and labor. The stump symbolizes the importance of the lumber industry in Minnesota's history. 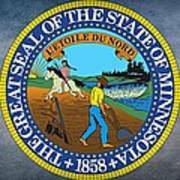 The Mississippi River and St. Anthony Falls are depicted to note the importance of these resources in transportation and industry. 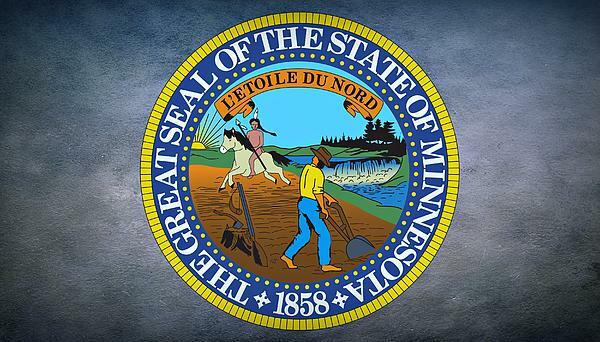 The cultivated ground and the plow symbolize the importance of agriculture in Minnesota. Beyond the falls three pine trees represent the state tree and the three great pine regions of Minnesota; the St. Croix, Mississippi, and Lake Superior.